BOTTOM LINE: A lively introduction to gentrification in five short plays presented in various NYC neighborhoods alongside the very citizens changing these communities. Even the most recent of New York transplants can quickly see the rapid changes occurring in almost every New York neighborhood. We are at a period of great inversion with younger people whose parents and grandparents left the city for the suburbs after WWII are now coming back in huge numbers. 5D (a collective of five female directors) is exploring the historic and social implications of such change in Around the Block, an evening of five short plays by five different playwrights each dealing with a different New York City neighborhood. 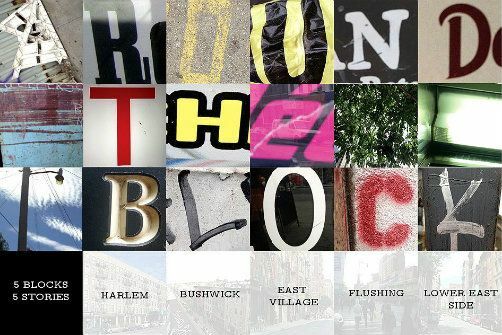 The series is performed in five different neighborhoods that each have their own relationship with gentrification: the East Village, Harlem, Long Island City and Bushwick. Each playwright takes a different tone in attacking and exploring the meaning of community is in a constantly changing neighborhood. All five plays are performed at each show. The evening I attended, the performance was at Alewife NYC, a fantastic (if not a bit gentrified) multilevel bar in Long Island City. The performance was upstairs of the noisy downstairs bar (props to sound designer Mark Van Hare for managing shifting noise levels). This contrasting atmosphere is undeniably a large part of the experience, intentional or not. The show begins somewhat organically with minimal lighting or conventions. Actor S. Lewis Feemster enters the space in a shiny new NYU fitted t-shirt and we know we're in the East Village. In this play by Korde Arrington Tuttle we get a contemporary look at the epicenter of New York transplants. Tori Keenan-Zelt's play Beautiful Tomorrow is a look at a major event in Flushing, Queens that is all over the news this year celebrating the 50th anniversary with the World's Fair of 1964. Other pieces by Tracy Cameron Francis and Christine Jean Chambers take us to Bushwick and to Harlem. While there are not necessarily any solutions or new ideas to changing neighborhoods brought about in any of the plays, there are fresh interpretations on the effects of shifting neighborhoods. Melody Erfani's play 97 Orchard St, created with writers Laura Jo Hess and Alexander Koo, and composer J.P. Makowski, imagines the history of cultural change in the Lower East Side as a sort of balletic musical chairs. Erfani's direction of the piece focuses on what this type of change might look like rather than trying to explain by using the common discourse. It's most effective because it transcends the noise that is heard daily on blogs and newspapers about neighborhoods being culturally destroyed. 97 Orchard Street is now better known as the address of the Lower East Side Tenement Museum. While a few of the plays in the series only crack the surface of larger issues within changing communities and neighborhoods, the marriage of having these plays performed in public spaces within these parts of the city is key. I can imagine how different the experience of the performances would have been at a space like La Maison d'Art in Harlem without the hundreds of bar patrons steps away as was the case at Alewife, and likely Jimmy's No. 43 in the East Village. For me, the paradox of the current neighborhood tenants boisterously indulging at the local waterhole while a performance about their very existence in this neighborhood was happening feet away played a big role in the success of the evening of short plays. I wonder if future performances of this collection of plays might even be a bit more bold and invasive by placing the performance directly in contact with these audiences unwittingly rather than selling proper tickets to a likely already gentrification-savvy audience. In any case, 5D is an exciting group of theatre makers creating down-and-dirty theatre in what is seemingly a fruitful collaborative collective. Their generosity to new plays and to their communities is admirable and promising. I can't wait to see the next step.